The International Council of Museums-Philippines (ICOM-Philippines) is the National Committee and Secretariat of ICOM in the country, an international organization of museums and museum professionals committed to the conservation, continuation and communication to society of the world’s natural and cultural heritage, present and future, tangible and intangible. ICOM has a unique professional network of institutions and museum professionals worldwide collaborating and participating in discussions and reflections concerning museum development. 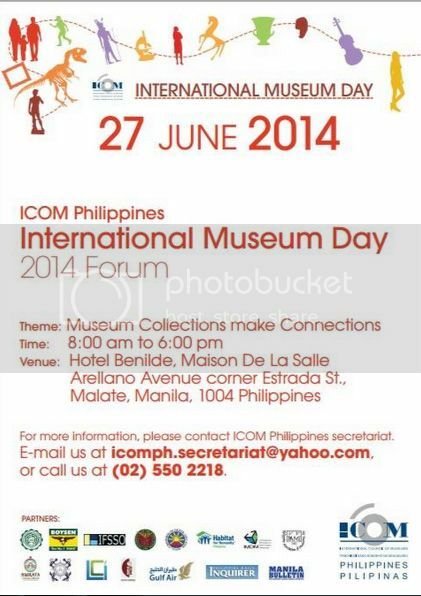 In line with the ICOM International Museums Day Celebration (IMD), ICOM-PH is pleased to announce its upcoming event entitled “IMD2014 Forum” echoing he ICOM theme, “Museum Collections make Connections” to be held on Friday, the 27th of June 2013 in Manila, Philippines. In partnership with the De La Salle -College of St. Benilde, Habitat for Humanity Philippines, University of the Philippines – Diliman, International Federation of Social Science Organizations, Philippine Association of Museums Inc, International Movement for Development Managers, Hiniraya Cultural Heritage and Development Foundation, GULF AIR, and other institutional partners, we will – as one team, celebrate the annual International Museum day in June and reflect on the global theme, “Museum Collections Make Connection” as we create the opportunity to introduce and strengthen new and creative collaborations among members, their museums and their partner stakeholders. The objective for International Museum Day (IMD2014) is to continuously raise public awareness worldwide on the role museums play in the development of society. The global standard theme of IMD2014 is “Museum Collections Make Connections.” As the world moves away from traditional methods of engagement, museums musty find new ways to engage with their communities by making their collections more accessible and relevant to their stakeholders. It also encourages public awareness of the role of the museums in the development of society and promotes the connection that exists between different types of collection and their audiences. ICOM – Philippines will be inviting representatives from its counterparts in Asia and Europe to share their won insights and best practices in making and keeping collections to the Filipinos. Speakers from province of Bohol will also be invited to share the current status of their lost treasures. Their presence will also solicit the help and support needed from the museum community in restoring and taking care of the collections affected by the recent natural disasters. Representatives of Indigenous People will also talk about their own collections that tell their stories. Congressman Teddy Baguilat of the lone district of Ifugao will share the collection, culture, heritage, and the current activities of the group of Indigenous People he belongs to. The Ifugaos are considered as the pride of the Philippine history and culture. ICOM – Philippines is looking forward to see in museum professionals, advocate of museums, culture and the arts of everyone else who would like to learn more about the best practices on taking care of one’s collections using standards of museums’ code of ethics. ICOM – Philippines is inviting the public to join us as we celebrate the achievements of ICOM, share experiences as museum professionals and take ourselves to the next level of synergy. If you would like to know more about ICOM Global, please visit icom.org or you may call ICOM-IMD Secretariat office at (632)550-2218. Please look for Ms. Mischelle Rico or Mia V. Morales.